Count on professional-quality documents. 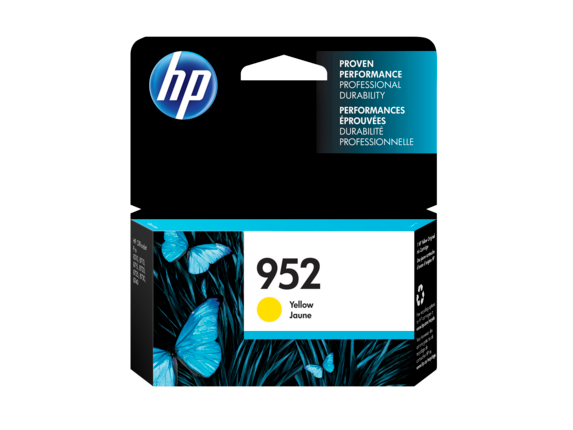 Original HP ink cartridges provide impressive reliability for dependable performance, consistent page yields, and standout results. Quickly print with individual inks and high-yield cartridge options. 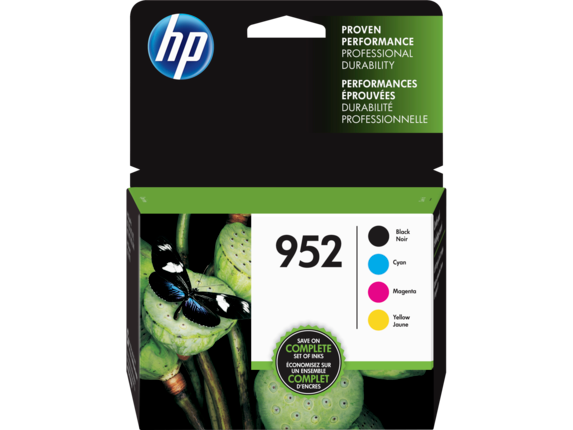 Tested in HP OfficeJet Pro 8700 Printer Series. Average continuous composite (cyan/magenta/yellow) yield based on ISO/IEC 24711 or HP testing methodology and continuous printing. Actual yield varies considerably based on content of printed pages and other factors. For details, see http://www.hp.com/go/learnaboutsupplies. 1 Water, smear, fade, and highlighter resistance based on ISO 11798 and internal HP testing. For details, see http://www.hp.com/go/printpermanence. 2 Based on cartridge yields for HP 952XL ink cartridges compared with HP 952A ink cartridges. For more information, see http://www.hp.com/go/learnaboutsupplies. 3 Program features, retailer participation, and availability may vary by country. Internet access is required and not included. For more information, visit http://www.hp.com/learn/suresupply. Not compatible with Windows® 2000. 4 Program availability varies. For more information, visit http://www.hp.com/recycle. Tested in HP OfficeJet Pro 8700 Printer Series. Average based on ISO/IEC 24711 or HP testing methodology and continuous printing. Actual yield varies considerably based on content of printed pages and other factors. For details, see http://www.hp.com/go/learnaboutsupplies. 1 Water, smear, fade, and highlighter resistance based on ISO 11798 and internal HP testing. For details, see http://www.hp.com/go/printpermanence. 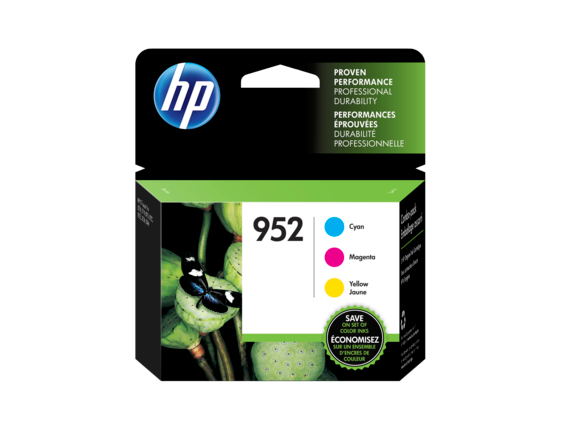 2 Based on cartridge yields for HP 952XL ink cartridges compared with HP 952A ink cartridges. For more information, see http://www.hp.com/go/learnaboutsupplies. 3 Program features, retailer participation, and availability may vary by country. Internet access is required and not included. For more information, visit http://www.hp.com/learn/suresupply. Not compatible with Windows® 2000. 4 Program availability varies. For more information, visit http://www.hp.com/recycle. 5 Compared with individual HP ink cartridges. Based on estimated U.S. street price. Actual retail pricing may vary. Tested in HP OfficeJet Pro 8700 Printer Series. For black, average based on ISO/IEC 24711 or HP testing methodology and continuous printing. For color, average continuous composite (cyan/magenta/yellow) yield based on ISO/IEC 24711 or HP testing methodology and continuous printing. Actual yield varies considerably based on content of printed pages and other factors. For details, see http://www.hp.com/go/learnaboutsupplies. Get up to 2x the pages with XL inks vs. standard cartridges. XL Black yields up to 2,000 pages. Color cartridges yield up to 700 pages each. One XL black ink and standard color inks bundled together for your convenience. Click here to see HP 952XL High Yield Black Original Ink Cartridge details. Click here to see HP 952 3-pack Cyan/Magenta/Yellow Original Ink Cartridges details. Print high-quality photos and documents with ease with toner and ink cartridges shipped directly from HP. Don’t waste precious hours of your day scanning the aisles of office supply stores trying to find the right type of cartridges for your printer. You can order all of the essential HP 952 ink cartridges right here. With the quick click of a button, your HP ink cartridges will be delivered straight to your door. 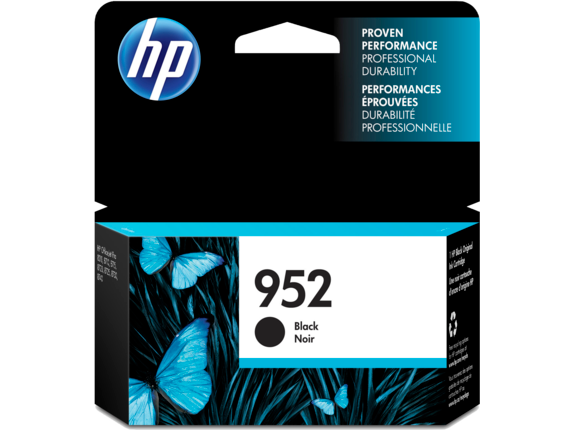 The HP 952 Black Original Ink Cartridge provides exceptional quality and performance for your printer. Forget about the hassle of constant cartridge replacement and print up to 1,000 pages before running dry. Capable of handling high-volume printing jobs in high-pressure situations the HP 952 Black Original Ink Cartridge produces professional grade black text, ideal for any business documents and contracts. Rest easy knowing that this ink is water-, smear-, and fade-resistant, meaning you can highlight important elements of a document freely. Try HP Multipurpose Paper with ColorLok® for fast drying, acid-free documents that won’t fade or discolor over time. And thanks to HP SureSupply, you’ll receive a notification when your cartridge starts running low and it’s time to order new ones. However, don’t be alarmed if your ink is running low; you can still complete your printing tasks with low ink levels without having to worry about fading text. 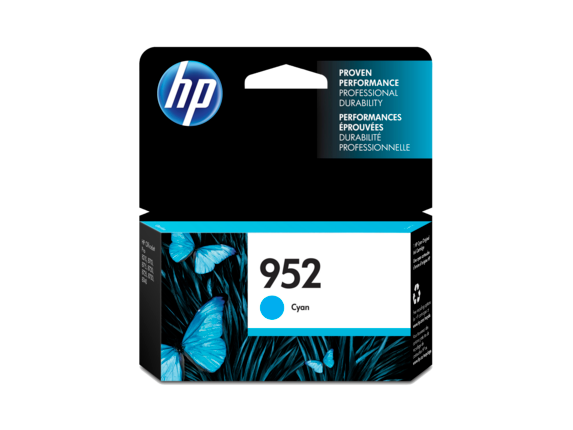 If you’re tired of constantly running out of ink and having to replace your cartridges, pick up an HP 952XL High Yield Original Ink Cartridge. High yield color cartridges come in cyan, magenta, and yellow, which you can order individually. With colored ink cartridges capable of printing up to 1,600 pages and black ink cartridges up to 3,000 pages, it’ll be awhile before you have to worry about replacing them. 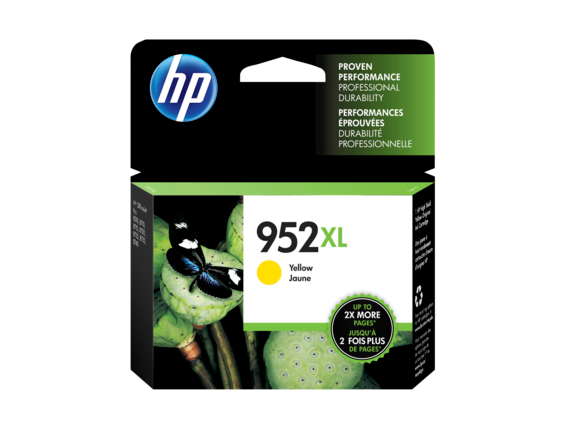 You can also bundle high yield black ink with color ink cartridges for even more convenience and savings. Why make shopping for ink cartridges more complicated than it needs to be? 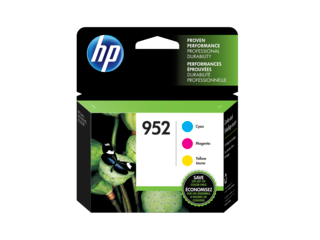 Cut out all the hassle and receive your ink fast with free, next-business-day shipping when you order from HPâ“‡ directly. Worried about the environmental impact of your used ink cartridges? Don’t be. It’s easy to recycle your used Original HP cartridges at no additional cost. Through HP Planet Partners, you can ensure that your used cartridges don’t end up in a landfill. And if you accidentally order the wrong type of ink cartridge or there’s damage to your order, HP® will accept returns and exchanges for up to 30 days after delivery. Looking to save even more on cartridges for your printer? With HP Instant Ink you can save up to 50% on ink and toner and never have to worry about running out again. Our ink replacement service is conveniently designed to deliver ink directly to you as soon as your cartridges start running low. Free Printing Plan: Print 15 pages per month. If you need to print more, each additional set of 10 pages comes at a specified cost. The HP Free Printing Plan is eligible on select printers. Occasional Printing Plan: Print 50 pages a month. If you don’t use all them, the pages roll over so you can save even more. Moderate Printing Plan: Print 100 pages per month. Any pages you don’t use will roll over. Frequent Printing Plan: Print 300 pages per month. This is the ideal plan for any office or business. You can save bundles when you sign up for this exceptional deal. Rollover up to 300 unused pages a month. There are no cancellation fees or contracts, and you can change plans quickly and easily.